Paul Ryan's retirement plans haven't just set off a shadow campaign for Speaker between his top deputies, Reps. Kevin McCarthy (Calif.) and Steve Scalise (La.). A slew of other ambitious Republicans are now eyeing slots on the leadership ladder, including the majority whip and conference chair posts. No one has made any official announcement that they're running for leadership jobs, but lawmakers are putting out feelers, quietly gauging how much support they would have for a bid after the Nov. 6 election. Colleagues have approached Rep. Jason Smith (R-Mo. ), the conference secretary, about a possible bid for GOP whip, the No. 3 job, while Rep. Gary Palmer (R-Ala.), a member of the conservative Freedom Caucus, is reaching out to friends about a bid for policy chairman, GOP sources said. There are also about a half dozen Republicans said to be angling for conference chair, the No. 4 leadership spot occupied for the past three terms by Rep. Cathy McMorris Rodgers (R-Wash.). They include a handful of younger rising stars, including Reps. Scott Taylor (R-Va.), 38, and Mia Love (R-Utah), 42, but also some veteran Republicans like Reps. Ann Wagner (R-Mo. ), a former top RNC official and ambassador under President George W. Bush, sources said. Rep. Mimi Walters (R-Calif.), a McCarthy ally who is the sophomore class's representative to leadership, is also evaluating the leadership landscape, said a source familiar with her thinking. She could also run for conference chair if there is an opening, or for National Republican Congressional Committee chairman if Rep. Steve Stivers (R-Ohio) doesn't seek a second term leading the GOP's campaign arm. Walters is one of Stivers's two top deputies at the NRCC, an organization that has never been led by a woman. "Obviously, it's fluid," a GOP aide said of the landscape. In an attempt to avoid Republican infighting over the Speaker's gavel, Ryan publicly backed McCarthy to be his successor last week - a move that led Scalise, the other possible contender for the top job, to also throw his support behind the majority leader. But Ryan's high-profile endorsement did little to quell jockeying for other slots further down the leadership ladder. If McCarthy or Scalise move up, that would reshuffle the decks and open up other spots on the leadership team. That's why, shortly after Ryan's retirement announcement, the GOP's youngest crop of House members started plotting ways to get a millennial lawmaker a seat at the leadership table. Lawmakers have floated Rep. Elise Stefanik (R-N.Y.), co-chair of the centrist Tuesday Group, as one possible contender for a leadership role. Stefanik has previously been approached by Republican leaders about potentially serving on the leadership team one day, according to one GOP source, though it's unclear whether she would be open to the idea. 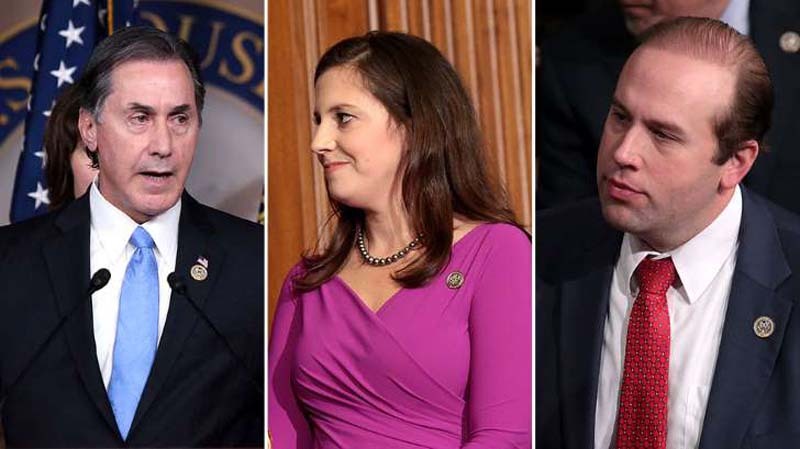 Republican strategists think it would be a smart move for the GOP to add the 33-year-old Stefanik, the youngest woman ever elected to Congress, to its leadership ranks. Taylor, another millennial lawmaker, is eyeing a bid for Republican conference chair, according to a source familiar with his thinking. But the former Navy SEAL, who has expressed frustration with the GOP's messaging efforts, would also be willing to rally behind a fellow millennial candidate for the job, the source said. "We need some of the millennial members of Congress at the table when the policy decisions are being made that will affect our generation as much as any," said freshman Rep. Matt Gaetz (R-Fla.). "There are a lot of the younger members that I've had informal discussions with that would like to see a younger person pursue one of the leadership positions." It's unclear where McMorris Rodgers will land next year, but an aide to the congresswoman called such palace intrigue "divisive D.C. chatter" and said Republicans need to be focused on the GOP agenda and winning in November. Asked in a local radio interview this week whether she herself might run for Speaker, McMorris Rodgers declined to answer. "My No. 1 priority is to continue working hard, getting results for the people of Eastern Washington, keeping our majority. That's going to be my focus between now and the end of the year," McMorris Rodgers told KTTH in Seattle. But she forcefully rejected rumors that she's following Ryan into retirement. "Those that are hoping that I'm going to retire or spreading that rumor hoping that I'll retire are going to be really disappointed because, yes, I am running for reelection," she said. Then there's the Freedom Caucus. Some members in the group of conservative hard-liners are seeking to cut a deal with McCarthy. These conservatives say they would back McCarthy's bid for Speaker in exchange for his support in making one of them majority leader or whip, GOP sources said. The group tried to strike a similar agreement with McCarthy when he ran for Speaker in 2015, but the California Republican abruptly dropped his bid after realizing he could not meet all of the conservatives' demands. While the No. 2 or No. 3 leadership spot might be a tough ask, the Freedom Caucus could still demand slots on powerful committees like Rules or Steering. The Speaker-controlled Rules panel dictates in what form a bill is brought to the House floor; the Steering panel decides who wins coveted committee chairmanships and seats. "They're going to want committee slots; I think that is going to be the ask," said a GOP aide with ties to the Freedom Caucus. "I don't think committee chairman is what they are going to ask for. They want to put soldiers in across the board and use that influence better." Just as Rep. Palmer is mulling a bid for policy chairman, the GOP source said other Freedom Caucus members may also run for other lower-level leadership posts, including GOP conference chair, vice chair and secretary. Those who occupy those jobs get a seat at the Speaker's weekly leadership meeting, where final policy decisions are often made. "I don't think it's a play for power. It's just an organic thing from members," the GOP aide said. "It's not an ideological ax to grind. It's just members saying they think this organization could be run differently."